Computer speakers, or multimedia speakers, are speakers external to a computer, that disable the lower fidelity built-in speaker. They often have a low-power internal amplifier. The standard audio connection is a 3.5 mm (approximately 1/8 inch) stereo phone connector often color-coded lime green (following the PC 99 standard) for computer sound cards. A few use an RCA connector for input. There are also USB speakers which are powered from the 5 volts at 500 milliamps provided by the USB port, allowing about 2.5 watts of output power. Computer speakers were introduced by Altec Lansing in 1990. The internal amplifiers require an external power source, usually an AC adapter. More sophisticated computer speakers can have a subwoofer unit, to enhance bass output, and these units usually include the power amplifiers both for the bass speaker, and the small satellite speakers. Some computer displays have rather basic speakers built-in. Laptops come with integrated speakers. Restricted space available in laptops means these speakers usually produce low-quality sound. For some users, a lead connecting computer sound output to an existing stereo system is practical. This normally yields much better results than small low-cost computer speakers. Computer speakers can also serve as an economy amplifier for MP3 player use for those who wish to not use headphones, although some models of computer speakers have headphone jacks of their own. A 3.5 mm headphone jack. Controls for volume, and sometimes bass and treble. In order to cut the cost of computer speakers (unless designed for premium sound performance), speakers designed for computers often lack an AM/FM tuner and other built-in sources of audio. However, the male 3.5 mm plug can be jury rigged with female 3.5 mm TRS phone connector to female stereo RCA adapters to work with stereo system components such as CD/DVD-Audio/SACD players (although computers have CD-ROM drives of their own with audio CD support), audio cassette players, turntables, etc. Despite being designed for computers, computer speakers are electrically compatible with the aforementioned stereo components. There are even models of computer speakers that have stereo RCA in jacks. 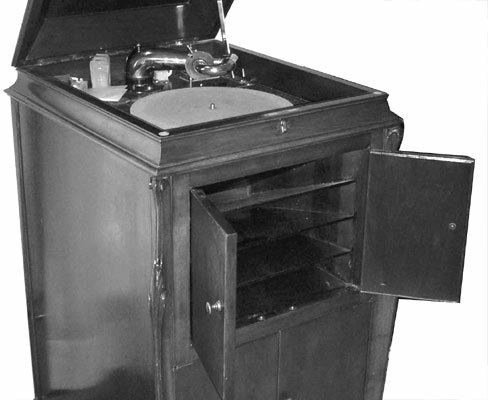 The standard dynamic loudspeaker that we know of today was developed in the 1920's and uses a magnetic field to move a coil or magnet which is connected to a diaphragm. There are other kinds of speakers/sound amplification devices besides the standard round speaker, in this article we cover just a few of the entire list: Horns, Piezoelectric speakers, Magnetostrictive speakers, Electrostatic Loudspeakers, Ribbon and Planar Magnetic Loudspeakers, Bending Wave Loudspeakers, Flat Panel Loudspeakers, Heil Airl Motion Transducers, Plasma Arc Speakers, and Digital Loudspeakers. The dynamic loudspeaker in the photo above outperforms many other types of speakers, and is lower cost to produce. For these reasons it is the most popular. We will outline some other types in this page. Horns were the earliest form of amplification. Horns do not use electricity. 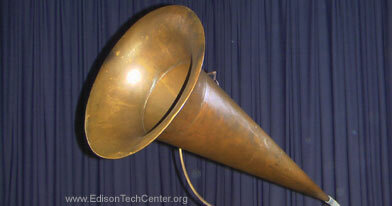 Thomas Edison, Magnavox, and Victrola all developed advanced and well-performing horns from 1880 to the 1920's. The problem with horns is that they could not amplify the sound very much. With the use of electrical amplification in the future loud sound could be generated to fill large public spaces. Horns remain a novelty for collectors today. 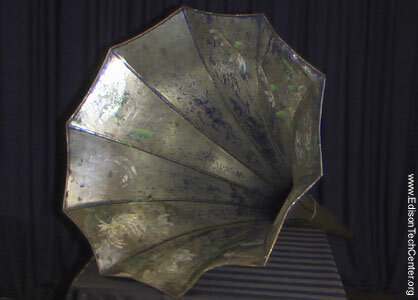 Above a straight copper horn used with wax cylinders. 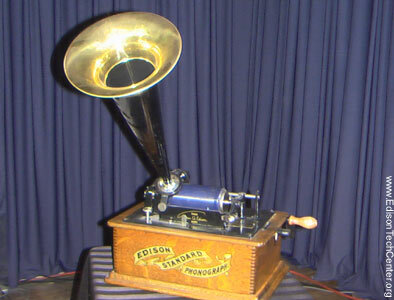 Above: Left: An Edison horn made from strips of tin Right: a small straight brass horn and wax cylinder phonograph, this type was manufactured by Edison's companies until 1913. It was replaced by the record. The smaller horn was used in smaller rooms of the home. 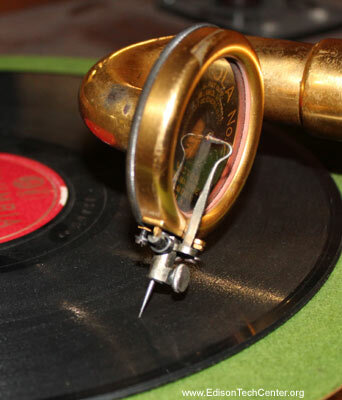 The needle moves up and down and forces the metal device above it to vibrate on the clear diaphragm (similar to a speaker). This vibration pushes air and makes a small amount of sound. 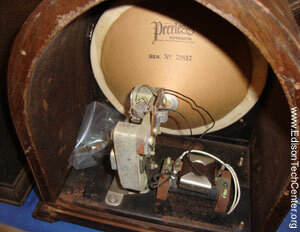 This sound is channeled in the brass arm down under the Victrola to a wooden horn inside the box (right photo). The horn amplifies the sound to an impressive level. Opening or closing the wood doors on the front controls loudness by blocking the horn inside. 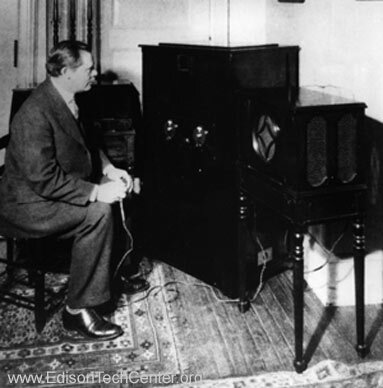 Right: 1927: Ernst Alexanderson - inventor of broadcast television tests the first television broadcast from the GE plant to his home. 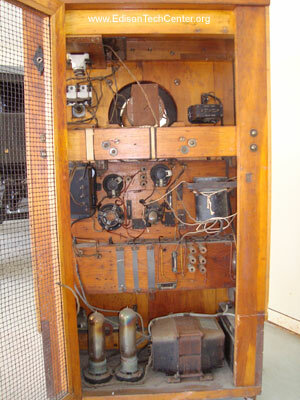 To his right you will see a standard radio of the time used for the audio. What is an electrodynamic loudspeaker? A: This is a device that uses an electromagnetic coil and diaphragm to create sound. This is the most common type of speaker in the world today. 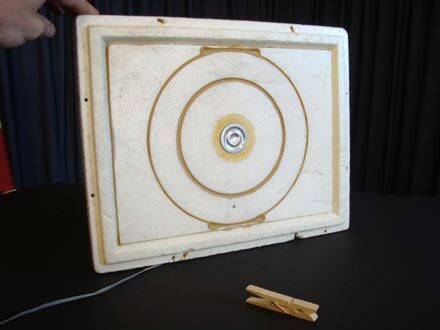 The modern speaker uses an electromagnet to turn electric signals of varying strength into movement. The coil of copper wire moves as the magnet energizes. This works using induction. The coil is connected to a cardboard/paper/vinyl "cone". The cone is a diaphragm that vibrates along with the coil. Sound is created and amplified by the diaphragm. 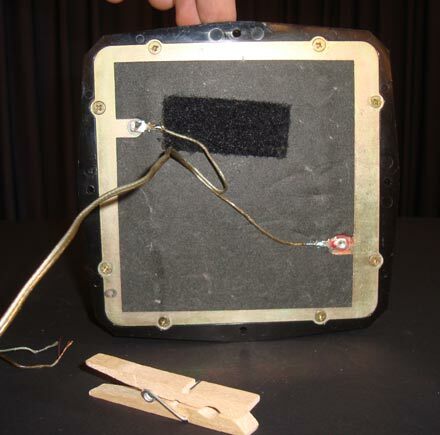 There are variations on how to build the speaker. 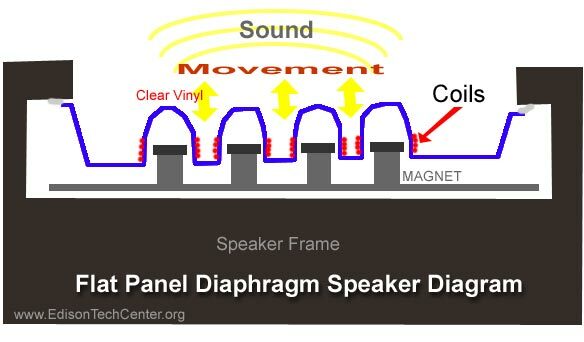 A given speaker is designed to produce a specific frequency range. Not all materials and construction designs produce all sounds the same: see tweeter, mid-range, woofer, subwoofer. Why did it take so long to invent the speaker? It sounds simple, but to build a speaker one needs to have an understanding of electricity, radio, sound waves, mechanics, chemistry and physics. Today an engineer is trained after a few years of college in these areas if they choose. Back in the early part of the 20th century the basic knowledge of math and frequencies was still being explored. 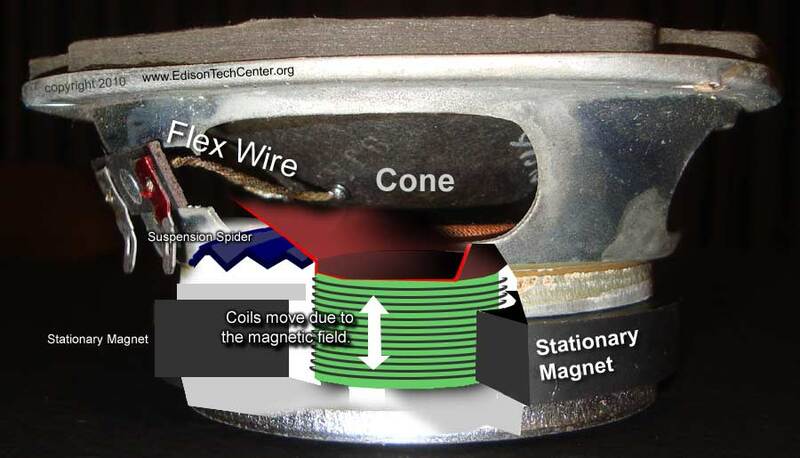 While the electromagnet part of the speaker was invented early on in the 1860s, it took 40 more years to develop a knowledge of acoustics and materials. C.W. Rice and E.W. Kellogg finally invented it by solving the final part of the puzzle. The final work was on how to shape the diaphragm and what materials to use. The recent developments in vacuum tubes in the 1910s helped to do sophisticated control of frequencies and power regulation. Sound is a form of energy passing through a gas or liquid medium. Understanding sound is in the realm of physics. There are two main measurements in sound: frequency and decibels. Frequency is responsible for the quality of sound in a speaker, decibels measure the 'loudness' of the speaker. Frequency: Humans can hear audio from 20 - 20,000 Hertz. Hertz is a measure of cycles per second. Sound is is a wave ranging from 0 level of energy to infinity. A middle 'C' tone on an instrument is not a solid constant level of energy is it sounds to our ears, it is a wave which peaks every 278 times per second. The human ear does NOT hear all frequencies with the same sensitivity. It is most sensitive to 2000 - 4000 Hz range. So a 100 dB (loudness level) sound at 20 Hz will not damage the ear as much as a sound at 3000 Hz. Most sounds fall in the lower range of our audible frequency range, however sounds at 16,000 or 20,000 Hz are important. These upper frequencies give us other information about a sound, such as the environment of the sound. If someone is speaking in a small room or auditorium we can tell thanks to the high frequencies. Developing a speaker which could reproduce the low and very high frequencies was the greatest final challenge in inventing the speaker. Of course since 1921 the speaker's abilities to reproduce frequencies got even better. Decibels: The other measure of sound which is important for a speakers performance is the loudness measured in decibels (dB). Decibels measure sound pressure. The higher the pressure, the more your eardrum pushes inward. Decibels is a logarithmic unit, which means that each unit indicates an increase in power by x10. The 'bel' in decibel originates from telecommunications pioneer Alexander Graham Bell. The need to measure sound efficiency in gave rise to the unit in 1923. 0 dB is set at .0002 microbar (pressure). 120 dB is enough to cause permanent damage to the human ear, however the ear will be more easily damaged at the 2-4kHz range. This aspect of the human body being more sensitive to certain frequencies is related to the species evolution. A baby's cry is located in the 4-5 kHz range. We are programed to be sensative to a baby's cry and human's scream. Similarly when we talk about the electric light, the human eye is more sensitive to frequencies in the green-yellow spectrum. You can read all about the development of the electric light on our page here. 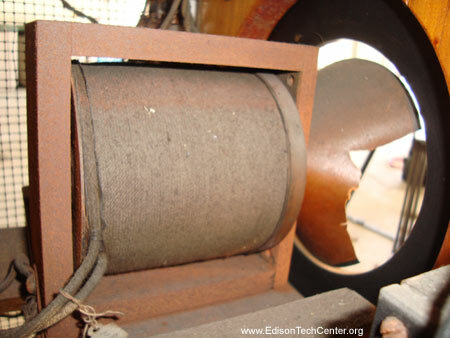 1861 - A simple type of electronic loudspeaker was developed by Johann Philipp Reis - a teacher at Friedrichsdorf, Germany. 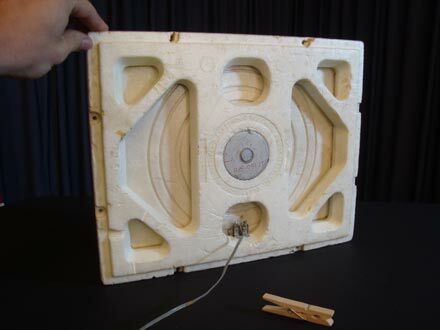 The speaker was crudely able to reproduce sound and just an experiment. 1876 - Alexander Graham Bell also tried to produce a speaker based on Reis's work. 1877 - The idea of the electromagnetic coil driven speaker is formulated by Werner Von Siemens, he used it with input signals of DC transients and telegraphic signals. 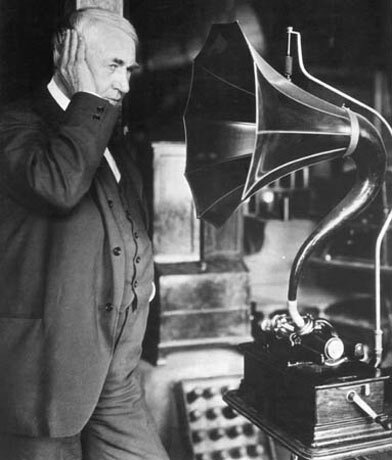 He had no way to amplify sound to create a useful speaker, but he theorized that this could eventually be done. 1877-1921 - Various inventors and engineers played with the idea of the electrodynamic loudspeaker but could only create rough distorted sounds. There was no way to electrically amplify the signal to create very loud sounds. The industry continued to rely on more advanced horns to create amplification. Above: The first prototype loudspeaker, finished in May 1921. The speaker cone is damaged. Inside the cabinet is a groundbreaking power amplification system. C.W. Rice of General Electric and E.W. Kellogg of AT&T worked together in Schenectady, New York to develop the modern speaker and first electric amplification system. They created a working prototype in 1921. Rice and Kellogg solved the final problems which led to a nice crisp sound. Previous attempts to make the loudspeaker created an unacceptable muffled sounding audio. This muffled sound was not good enough to compete with the horn which was well established in the market. Rice and Kellogg were able to fully understand the reproduction of all the frequencies necessary to create an accurate audio sound. Their prototype had enough of a dynamic range in frequencies to be better than the horn, while possessing the ability to greatly increase loudness (dB). In 1925 they filed for patents and made a speech in St. Louis to the AIEE. After several years of work they perfected it as the first commercial product of it's kind called the Radiola Loudspeaker #104. It sold in 1926 for $ 250 (about $3000 today (US dollars)). The speaker was produced under the company name of RCA. Above: The first speaker. The coil was stationary unlike modern speakers, the moving magnet was inside. Copper wires were insulated with cloth. This prototype was built by C.W. Rice and E.W. Kellogg in 1921. The speaker worked, but needed improvement to make it smaller so it could fit into radio sets. 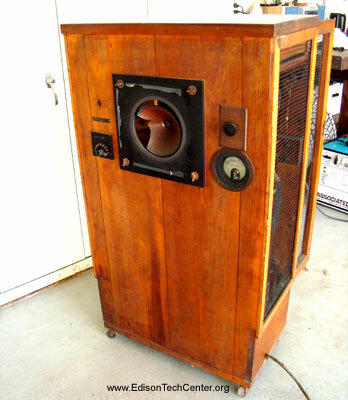 Within a few years they improved the speaker so it could fit into a radio 20 x 12 x 16" high. RCA: The Radio Corporation of America sold the first speaker instead of General Electric because the RCA was created as a consortium of many US companies. RCA was created under pressure from the US government as a way of having the major electric technology companies work together on patents in order to more easily create finished products which could compete with state-sponsored European companies. European companies like Philips and Siemens had a leadership which could easily mobilize patents for creation of products. Under the more true capitalist systems in the US at the time, companies fought over patent royalties and kept secrets from each other. RCA was able to collectivize research in order to create better technology. In addition to having a strong US company to compete internationally in the radio market, having better technology was important for the US during escalating war tensions prior to WW2. World War 1 taught the important lesson not to be left behind, and that radio technology could mean the difference between winning or being crushed. Tweeter - 2kHz - 20kHz. used to produce all high end frequencies. There are many ways to construct a tweeter today. Most are electrodynamic (magnetic) speakers however there are piezo-electric, electrostatic and plasma tweeters. Mid-range Speaker - 300 - 5kHz. This speaker covers most human voice along with most instruments. Woofer - 40 - 1 kHz. low frequencies. 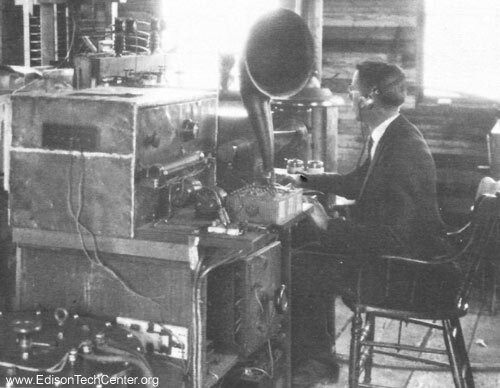 The woofer goes back to work done in the 1930s at Bell Labs. Subwoofer - 20 - 200 Hz. very low frequencies. The human ear can only hear down to 20Hz. low frequency sound is unidirectional. This means that it can be placed anywhere in a room and be heard from any point with the same sound quality. Subwoofers also produce sound waves that penetrate walls easily. Noise from this type of speaker is even known to penetrate vertically through 5+ floors of concrete apartment buildings. Needless to say it is easy to get in trouble with local noise ordinances. If you plan your next loud event you may want to think about frequencies and the ability of objects to absorb/stop or reflect sound. Subwoofers were developed in the 1960s. Flat Panel Speakers use voice coils or other apparatus mounted to flat panels to act as the source of sound. The flat panel acts as a diaphragm. Below are some examples of different designs. 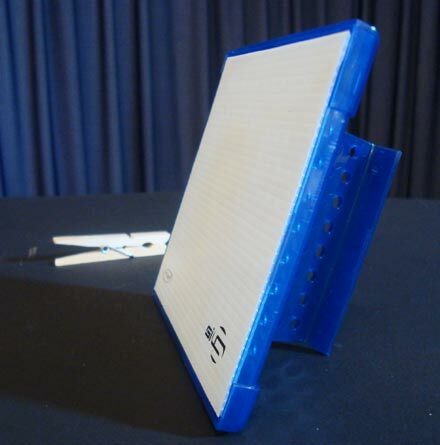 Different materials can be used as a diaphragm, from vinyl to Styrofoam. This is different from a diaphragm speaker in that the moving voice coil is not wrapped around the same material as the flat panel. The panel part is adhered to the coil assembly. Standard flat panel electrodynamic loudspeaker have been difficult to make because it is difficult to vibrate the entire flat surface evenly while creating good frequency response. Thus other speaker types have evolved to try to make a flat speaker. 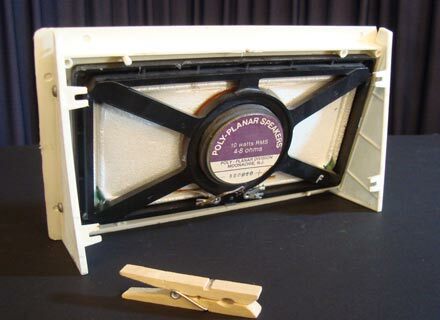 Planar magnetic speaker: Has a conductor attached/embedded in the diaphragm of styrofoam. The diaphragm moves forward and backward to make sound. This type of speakers works better than a standard flat electrodynamic loudspeaker because the entire styrofoam flat surface moves easily. 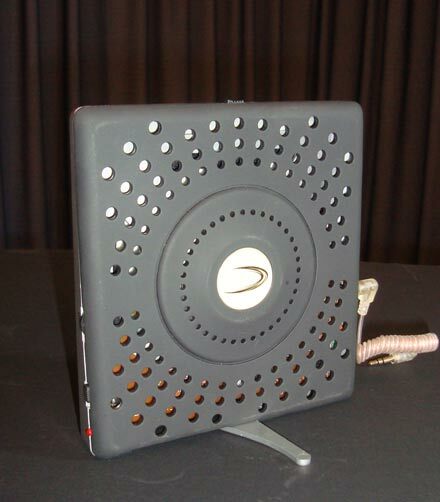 The electrostatic flat panel speaker uses two metal grids with a diaphragm made of a plastic sheet. The sheet is coated with graphite which is electrically conductive. The diaphragm has a constant charge, high voltage audio signal is created by the grids which are really electrodes. It has poor bass response but the speakers look interesting as a rectangular flat screen. If combined with a regular electrodynamic woofer it can be made into a full sound system. Diaphragm Speakers. This speaker is related to the electrodynamic loudspeaker in that it uses magnetic fields to move an element, however its shape is different. This speaker has the coil directly mounted on the diaphragm. 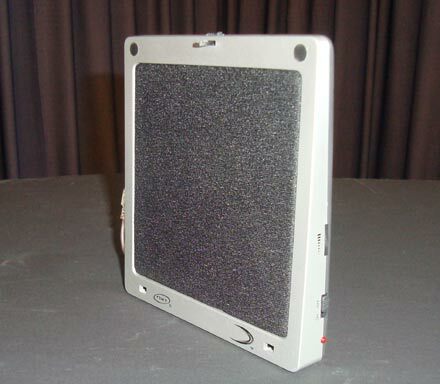 Below is an example of a flat panel style diaphragm speaker. The copper coils have been wrapped around the base of the clear plastic bulges in the photos below. The entire clear plastic sheet below moves to create sound. See the diagram below. This is a heavier speaker than the flat panel speakers above. Plasma is ionized gas, or current sent through a gas. Plasma is responsive to electrical fields, therefore you can turn electric signal of sound into an electric field which manipulates the plasma. The plasma does have mass and will vibrate creating sound similar to how a diaphragm moves air to make sound. This kind of speaker is visually quite interesting but limited in sound quality. The speaker has reliability problems and therefore remains just a novelty. Piezoelectric speakers are limited in frequency response therefore they are only used as tweeters or in small electrical devices like watches/clocks to make simple sounds. Piezoelectronics are a solid state technology which makes them durable and good for use as a microphone underwater. These speakers are used as microphones in submarine warfare, they can detect other microphones and hear sounds of other vessels. The mouse sometimes features other elements, such as "wheels", which allow the user to perform various system-dependent operations, or extra buttons or features that can add more control or dimensional input. The mouse's motion typically translates into the motion of a pointer on a display, which allows for fine control of a graphical user interface. The earliest known publication of the term mouse as a computer pointing device is in Bill English's 1965 publication "Computer-Aided Display Control". A false etymology exists, claiming "mouse" is an acronym for "Manually Operated Utility for Selecting Equipment". The online Oxford Dictionaries entry for mouse states the plural for the small rodent is mice, while the plural for the small computer connected device is either mice or mouses. However, in the use section of the entry it states that the more common plural is mice, and that the first recorded use of the term in the plural is mice as well (though it cites a 1984 use of mice when there were actually several earlier ones, such as J. C. R. Licklider's "The Computer as a Communication Device" of 1968). According to the fifth edition of The American Heritage Dictionary of the English Language the plural can be either "mice" or "mouses". The trackball developed by Tom Cranston, Fred Longstaff and Kenyon Taylor working on the Royal Canadian Navy's DATAR project in 1952. It used a standard Canadian five-pin bowling ball. The trackball, a related pointing device, was invented as part of a post-World War II-era radar plotting system called Comprehensive Display System (CDS) by Ralph Benjamin when working for the British Royal Navy Scientific Service in 1946. Benjamin's project used analog computers to calculate the future position of target aircraft based on several initial input points provided by a user with a joystick. Benjamin felt that a more elegant input device was needed and invented a ball tracker called roller ball for this purpose. Whilst patented in 1947, only a prototype was built and the device instead kept as a secret outside military. Another early trackball was built by Tom Cranston, Fred Longstaff and Kenyon Taylor as part of the Royal Canadian Navy's DATAR (Digital Automated Tracking and Resolving) system in 1952. DATAR was similar in concept to Benjamin's display, but used a digital computer to calculate tracks, and sent the resulting data to other ships in a task force using pulse-code modulation radio signals. This trackball used a standard Canadian five-pin bowling ball. It was not patented, as it was a secret military project as well. Independently, Douglas Engelbart at the Stanford Research Institute (now SRI International) invented the first mouse prototype in 1963, with the assistance of his lead engineer Bill English. They christened the device the mouse as early models had a cord attached to the rear part of the device looking like a tail and generally resembling the common mouse. Engelbart never received any royalties for it, as his employer SRI held the patent, which ran out before it became widely used in personal computers. The invention of the mouse was just a small part of Engelbart's much larger project, aimed at augmenting human intellect via the Augmentation Research Center. Several other experimental pointing-devices developed for Engelbart's oN-Line System (NLS) exploited different body movements – for example, head-mounted devices attached to the chin or nose – but ultimately the mouse won out because of its speed and convenience. The first mouse, a bulky device (pictured) used two wheels perpendicular to each other: the rotation of each wheel translated into motion along one axis. Filed in 1967, Engelbart received patent US3,541,541 on November 17, 1970 for an "X-Y Position Indicator for a Display System". At the time, Engelbart envisaged that users would hold the mouse continuously in one hand and type on a five-key chord keyset with the other. The concept was preceded in the 19th century by the telautograph, which also anticipated the fax machine. On 2 October 1968, just a few months before Engelbart released his demo on 9 December 1968, a mouse device named Rollkugel (German for "rolling ball") was released that had been developed and published by the German company Telefunken. As the name suggests and unlike Engelbart's mouse, the Telefunken model already had a ball, as seen in most later mechanical models up to the present. It was based on an earlier trackball-like device (also named Rollkugel) embedded into radar flight control desks, which had been developed around 1965 by a team led by Rainer Mallebrein at Telefunken Konstanz for the German Bundesanstalt für Flugsicherung (de) as part of their TR 86 process computer system with its SIG 100-86 vector graphics terminal. When the development for the Telefunken main frame TR 440 (de) began in 1965, Mallebrein and his team came up with the idea of "reversing" the existing Rollkugel into a moveable mouse-like device, so that customers did not have to be bothered with mounting holes for the earlier trackball device. Together with light pens and trackballs, it was offered as optional input device for their system since 1968. Some samples, installed at the Leibniz-Rechenzentrum in Munich in 1972, are still well preserved. 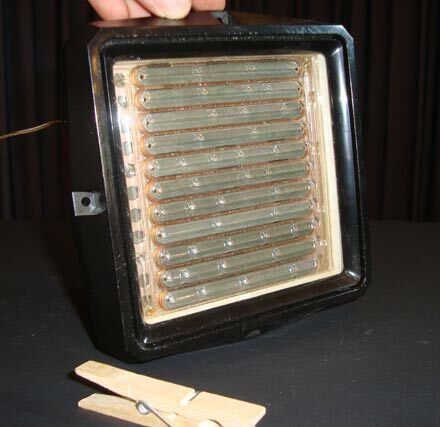 Telefunken considered the invention too small to apply for a patent on their device. The Xerox Alto was one of the first computers designed for individual use in 1973, and is regarded as the grandfather of computers that utilize the mouse. Inspired by PARC's Alto, the Lilith, a computer, which had been developed by a team around Niklaus Wirth at ETH Zürich between 1978 and 1980, provided a mouse as well. The third marketed version of an integrated mouse shipped as a part of a computer and intended for personal computer navigation came with the Xerox 8010 Star Information System in 1981. In 1982, Microsoft made the decision to make the MS-DOS program Microsoft Word mouse-compatible and developed the first PC-compatible mouse. Microsoft's mouse shipped in 1983, thus beginning Microsoft Hardware. However, the mouse remained relatively obscure until the 1984 appearance of the Macintosh 128K, which included an updated version of the original Lisa Mouse. In 1984 PC columnist John C. Dvorak stated the mouse as a reason the Macintosh would fail. German company Telefunken published on their early ball mouse on October 2, 1968. Telefunken's mouse was sold as optional equipment for their computer systems. Bill English, builder of Engelbart's original mouse, created a ball mouse in 1972 while working for Xerox PARC. 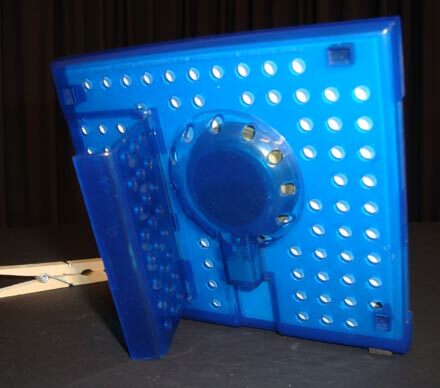 Mechanical mouse, shown with the top cover removed. The scroll wheel is grey, to the right of the ball. 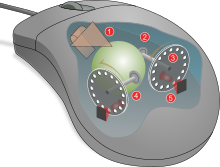 The ball mouse has two freely rotating rollers. They are located 90 degrees apart. One roller detects the forward–backward motion of the mouse and other the left–right motion. Opposite the two rollers is a third one (white, in the photo, at 45 degrees) that is spring-loaded to push the ball against the other two rollers. Each roller is on the same shaft as an encoder wheel that has slotted edges; the slots interrupt infrared light beams to generate electrical pulses that represent wheel movement. Each wheel's disc, however, has a pair of light beams, located so that a given beam becomes interrupted, or again starts to pass light freely, when the other beam of the pair is about halfway between changes. Simple logic circuits interpret the relative timing to indicate which direction the wheel is rotating. This incremental rotary encoder scheme is sometimes called quadrature encoding of the wheel rotation, as the two optical sensor produce signals that are in approximately quadrature phase. The mouse sends these signals to the computer system via the mouse cable, directly as logic signals in very old mice such as the Xerox mice, and via a data-formatting IC in modern mice. The driver software in the system converts the signals into motion of the mouse cursor along X and Y axes on the computer screen. Modern computer mice took form at the École Polytechnique Fédérale de Lausanne (EPFL) under the inspiration of Professor Jean-Daniel Nicoud and at the hands of engineer and watchmaker André Guignard. This new design incorporated a single hard rubber mouseball and three buttons, and remained a common design until the mainstream adoption of the scroll-wheel mouse during the 1990s. In 1985, René Sommer added a microprocessor to Nicoud's and Guignard's design. Through this innovation, Sommer is credited with inventing a significant component of the mouse, which made it more "intelligent;" though optical mice from Mouse Systems had incorporated microprocessors by 1984. Optical mice make use of one or more light-emitting diodes (LEDs) and an imaging array of photodiodes to detect movement relative to the underlying surface, rather than internal moving parts as does a mechanical mouse. A laser mouse is an optical mouse that uses coherent (laser) light. The earliest optical mice detected movement on pre-printed mousepad surfaces, whereas the modern optical mouse works on most opaque surfaces; it is usually unable to detect movement on specular surfaces like glass. Laser diodes are also used for better resolution and precision. Battery powered, wireless optical mice flash the LED intermittently to save power, and only glow steadily when movement is detected. Often called "air mice" since they do not require a surface to operate, inertial mice use a tuning fork or other accelerometer (US Patent 4787051, published in 1988) to detect rotary movement for every axis supported. The most common models (manufactured by Logitech and Gyration) work using 2 degrees of rotational freedom and are insensitive to spatial translation. The user requires only small wrist rotations to move the cursor, reducing user fatigue or "gorilla arm". Also known as bats, flying mice, or wands, these devices generally function through ultrasound and provide at least three degrees of freedom. Probably the best known example would be 3Dconnexion/Logitech's SpaceMouse from the early 1990s. In the late 1990s Kantek introduced the 3D RingMouse. This wireless mouse was worn on a ring around a finger, which enabled the thumb to access three buttons. The mouse was tracked in three dimensions by a base station. Despite a certain appeal, it was finally discontinued because it did not provide sufficient resolution. A recent consumer 3D pointing device is the Wii Remote. While primarily a motion-sensing device (that is, it can determine its orientation and direction of movement), Wii Remote can also detect its spatial position by comparing the distance and position of the lights from the IR emitter using its integrated IR camera (since the nunchuk accessory lacks a camera, it can only tell its current heading and orientation). The obvious drawback to this approach is that it can only produce spatial coordinates while its camera can see the sensor bar. For more details on this topic, see PS/2 connector. In 1986 Apple first implemented the Apple Desktop Bus allowing the daisy-chaining together of up to 16 devices, including arbitrarily many mice and other devices on the same bus with no configuration whatsoever. Featuring only a single data pin, the bus used a purely polled approach to computer/mouse communications and survived as the standard on mainstream models (including a number of non-Apple workstations) until 1998 when iMac joined the industry-wide switch to using USB. Beginning with t Bronze Keyboard" PowerBook G3 in May 1999, Apple dropped the external ADB port in favor of USB, but retained an internal ADB connection in the PowerBook G4 for communication with its built-in keyboard and trackpad until early 2005. The Amiga and the Atari ST use an Atari standard DE-9 connector for mice, the same connector that is used for joysticks on the same computers and numerous 8-bit systems, such as the Commodore 64 and the Atari 2600. However, the signals used for mice are different from those used for joysticks. As a result, plugging a mouse into a joystick port causes the "joystick" to continuously move in some direction, even if the mouse stays still, whereas plugging a joystick into a mouse port causes the "mouse" to only be able to move a single pixel in each direction. Other uses of the mouse's input occur commonly in special application-domains. In interactive three-dimensional graphics, the mouse's motion often translates directly into changes in the virtual camera's orientation. For example, in the first-person shooter genre of games (see below), players usually employ the mouse to control the direction in which the virtual player's "head" faces: moving the mouse up will cause the player to look up, revealing the view above the player's head. A related function makes an image of an object rotate, so that all sides can be examined. When mice have more than one button, software may assign different functions to each button. Often, the primary (leftmost in a right-handed configuration) button on the mouse will select items, and the secondary (rightmost in a right-handed) button will bring up a menu of alternative actions applicable to that item. For example, on platforms with more than one button, the Mozilla web browser will follow a link in response to a primary button click, will bring up a contextual menu of alternative actions for that link in response to a secondary-button click, and will often open the link in a new tab or window in response to a click with the tertiary (middle) mouse button. (left) Triple-click: clicking the button three times in quick succession. Right-click: clicking the secondary button. Middle-click: clicking the ternary button. Button chording (a.k.a. Rocker navigation). Some systems allow two or more mice to be used at once as input devices. 16-bit era home computers such as the Amiga used this to allow computer games with two players interacting on the same computer. The same idea is sometimes used in collaborative software, e.g. to simulate a whiteboard that multiple users can draw on without passing a single mouse around. Microsoft Windows, since Windows 3.1, has supported multiple simultaneous pointing devices. Because Windows only provides a single screen cursor, using more than one device at the same time requires cooperation of users or applications designed for multiple input devices. Windows also has full support for multiple input/mouse configurations for multiuser environments. The introduction of Vista and Microsoft Surface (now known as Microsoft PixelSense) introduced a new set of input APIs that were adopted into Windows 7, allowing for 50 points/cursors, all controlled by independent users. The new input points provide traditional mouse input; however, are designed for more advanced input technology like touch and image. They inherently offer 3D coordinates along with pressure, size, tilt, angle, mask, and even an image bitmap to see and recognize the input point/object on the screen. As of 2009, Linux distributions and other operating systems that use X.Org, such as OpenSolaris and FreeBSD, support 255 cursors/input points through Multi-Pointer X. However, current no window managers support Multi-Pointer X leaving it relegated to custom software usage. The three-button scrollmouse has become the most commonly available design. As of 2007 (and roughly since the late 1990s), users most commonly employ the second button to invoke a contextual menu in the computer's software user interface, which contains options specifically tailored to the interface element over which the mouse cursor currently sits. By default, the primary mouse button sits located on the left-hand side of the mouse, for the benefit of right-handed users; left-handed users can usually reverse this configuration via software. Mickeys per second is a unit of measurement for the speed and movement direction of a computer mouse. One mickey is approximately 1/200th of an inch. But speed can also refer to the ratio between how many pixels the cursor moves on the screen and how far the mouse moves on the mouse pad, which may be expressed as pixels per Mickey, or pixels per inch, or pixels per cm. The directional movement is called the horizontal mickey count and the vertical mickey count. The computer industry often measures mouse sensitivity in terms of counts per inch (CPI), commonly expressed as dots per inch (DPI) – the number of steps the mouse will report when it moves one inch. In early mice, this specification was called pulses per inch (ppi). The Mickey originally referred to one of these counts, or one resolvable step of motion. If the default mouse-tracking condition involves moving the cursor by one screen-pixel or dot on-screen per reported step, then the CPI does equate to DPI: dots of cursor motion per inch of mouse motion. The CPI or DPI as reported by manufacturers depends on how they make the mouse; the higher the CPI, the faster the cursor moves with mouse movement. However, software can adjust the mouse sensitivity, making the cursor move faster or slower than its CPI. Current software can change the speed of the cursor dynamically, taking into account the mouse's absolute speed and the movement from the last stop-point. In most software[specify] this setting is named "speed", referring to "cursor precision". However, some software[specify] names this setting "acceleration", but this term is in fact incorrect. The mouse acceleration, in the majority of mouse software, refers to the setting allowing the user to modify the cursor acceleration: the change in speed of the cursor over time while the mouse movement is constant. For simple software, when the mouse starts to move, the software will count the number of "counts" or "mickeys" received from the mouse and will move the cursor across the screen by that number of pixels (or multiplied by a rate factor, typically less than 1). The cursor will move slowly on the screen, having a good precision. When the movement of the mouse passes the value set for "threshold", the software will start to move the cursor more quickly, with a greater rate factor. Usually, the user can set the value of the second rate factor by changing the "acceleration" setting. Most optical and laser mice do not require a pad. Whether to use a hard or soft mousepad with an optical mouse is largely a matter of personal preference. One exception occurs when the desk surface creates problems for the optical or laser tracking, for example, a transparent or reflective surface. Around 1981 Xerox included mice with its Xerox Star, based on the mouse used in the 1970s on the Alto computer at Xerox PARC. Sun Microsystems, Symbolics, Lisp Machines Inc., and Tektronix also shipped workstations with mice, starting in about 1981. Later, inspired by the Star, Apple Computer released the Apple Lisa, which also used a mouse. However, none of these products achieved large-scale success. Only with the release of the Apple Macintosh in 1984 did the mouse see widespread use. Mice often function as an interface for PC-based computer games and sometimes for video game consoles. Due to the cursor-like nature of the crosshairs in first-person shooters, a combination of mouse and keyboard provides a popular way to play first person shooter games. Players use the X-axis of the mouse for looking (or turning) left and right, and the Y-axis for looking up and down. Many gamers prefer this primarily in First Person Shooter games over a gamepad or joypad because it provides a higher resolution for input, so they are able to make small, precise motions in the game more easily. The left button usually controls primary fire. If the game supports multiple fire modes, the right button often provides secondary fire from the selected weapon. Games with only a single fire mode will generally map secondary fire to ironsights. In some games, the right button may also provide bonus options for a particular weapon, such as allowing access to the scope of a sniper rifle or allowing the mounting of a bayonet or silencer. Gamers can use a scroll wheel for changing weapons (or for controlling scope-zoom magnification, in older games). On most first person shooter games, programming may also assign more functions to additional buttons on mice with more than three controls. A keyboard usually controls movement (for example, WASD for moving forward, left, backward and right, respectively) and other functions such as changing posture. Since the mouse serves for aiming, a mouse that tracks movement accurately and with less lag (latency) will give a player an advantage over players with less accurate or slower mice. Many games provide players with the option of mapping their own choice of a key or button to a certain control. An early technique of players, circle strafing, saw a player continuously strafing while aiming and shooting at an opponent by walking in circle around the opponent with the opponent at the center of the circle. Players could achieve this by holding down a key for strafing while continuously aiming the mouse towards the opponent. Games using mice for input are so popular that many manufacturers make mice specifically for gaming. Such mice may feature adjustable weights, high-resolution optical or laser components, additional buttons, ergonomic shape, and other features such as adjustable CPI. After id Software's Doom, the game that popularized first person shooter games but which did not support vertical aiming with a mouse (the y-axis served for forward/backward movement), competitor 3D Realms' Duke Nukem 3D became one of the first games that supported using the mouse to aim up and down. This and other games using the Build engine had an option to invert the Y-axis. The "invert" feature actually made the mouse behave in a manner that users now regard as non-inverted (by default, moving mouse forward resulted in looking down). Soon after, id Software released Quake, which introduced the invert feature as users now know it. Other games using the Quake engine have come on the market following this standard, likely due to the overall popularity of Quake.